DJ Obey40 Universal DMX Controller works with any DMX enabled device. First off this rental is ideal for control of stage lighting, DJ lighting, and fog machines where control of your output is required. Furthermore, almost all lighting rented is DMX enabled. Finally, you can control lighting, fog and strobe effects from one easy to use unit. This unit allows for control of up to 12 fixtures at 16 channels each. Because it has a larger capacity, the Obey 40 has 30 banks on 8 scenes, or up to 240 scenes. 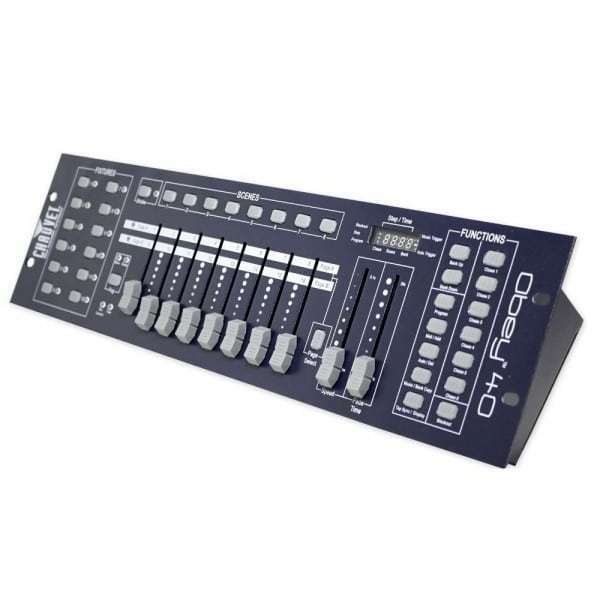 This unit offers the flexibility and adds fog and strobe control and MIDI compatibility. Easily increase effects with fog and strobe controls, reversible sliders, beat activation, tap-sync and auto run. Furthermore enhance light shows with 6 sets of chase effects containing 240 scenes. This universal DMX controller is capable of handling all of our DMX capable lighting fixtures such as our new super strong black light cannon. **Notes: this rental requires power, plan accordingly.